Google had a powerful feature that allowed you to block all search results from a domain. The feature was quickly removed from the interface, but Google still included it in the search preferences page. Last year, the feature disappeared and it came back after a few weeks, but not everyone could use it. Now Google officially discontinued Blocked Sites. 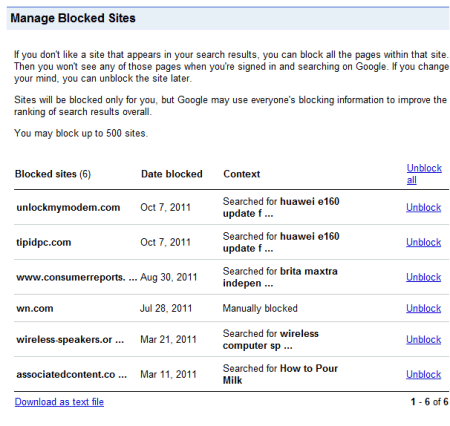 "To block particular sites from your search results, we recommend the Personal Blocklist Chrome extension from Google. You may also download your existing blocked sites list as a text file." Blocked Sites isn't Google's first attempt to create a feature that lets you hide results from certain domains, so I'm sure we'll see other similar features in the future. FU google, how many times can I get ticked off in a couple weeks, adblock plus, blocked domains, and reader. WTF? Google becomes more and more evil every day. it is not good practice for Google search as it is doing all the things such no competitors in market so . Is it any surprise? This feature essentially costs them ad revenue by allowing people to block those most annoying sites and clicking on them thinking they offer good information. Google has always cared about their ad stuff, but it just seem that now, it's ALL they care about. ANYTHING that cuts into that is going away. The features removed are extremely to exclude spam sites. Now apparently Google has officially live spam sites. Since the current CEO wanted to follow the philosophy of Steve Jobs, the services management had been becoming more sinister everyday, and Google is becoming a bad Apple, and lost its mind, forgetting the root of Google -- collective wisdom. This last year or so has essentially been the story of Google shifting away from moving everything into services that you access through *a* web browser, to pushing everything back onto the client machine (bear with me). The wider web doesn't seem too promising to Google for much greater monetisation, and I think they believe that the only way to significantly greater profit is to control the distribution as well as the endpoint: Google Chrome. Expect more online services to be axed in favour of browser extensions and ChromeOS features: iGoogle, Reader, the lack of work on Contacts and Tasks, and even the stagnation of Docs all suggest to me that Google doesn't want you accessing their services through other browsers any more. The main question for me is to ask which avenue they will choose to squeeze money from this hold in future. Microsoft has tried it before, and failed. Will Google?